Beijingers enjoyed a rare breath of fresh air this week. The city’s smog levels fell to their lowest levels in recent years, as authorities scrambled to shut down factories and curb car use so that China’s Second World War victory military parade had a pollution-free backdrop. But the blue skies will likely dissipate once the celebrations are over and cars go back on the roads, construction work restarts and factories resume production. With China’s chronic smog in mind, Dutch architect Daan Roosegaarde has come up with an innovative solution he says will help cities such as Beijing clean up toxic air and harmful pollutants. The seven metre unit will use ionic filters to charge and remove smog particles by blowing fresh air out of the tower’s side vents. This will create a high-pressure zone – bubbles’ of air, which will be 75% cleaner than the rest of the city. The Dutch designers have raised money on crowd-sourcing websiteKickstarter to make their tower a reality and an opening ceremony for their first model will be held in their home city of Rotterdam in the first week of September. The technology is similar to that used in hospitals. “In a few hours it will clean (air) in a small space; if you leave it on for a couple of days it cleans a small neighbourhood” Roosegaarde said. It is also highly energy efficient, using about 14,000 kilowatts of power – less than a kettle, Roosegaarde told chinadialogue. In Rotterdam the tower will be powered by wind energy, while elsewhere he hopes it will run on solar-generated electricity. If enough funds are raised, the plan is to take the tower on a tour of smog-choked cities around the world – including Beijing, New Delhi, Paris, Los Angeles and Mexico City. Made out of strong durable steel, the tower can be shipped and set up in a matter of days. The idea came to Roosegaarde on a trip to smoggy Beijing, which he hopes will be one of the first stops on the tower’s world tour. The Beijing health department has sent a delegation to visit the opening ceremony in Rotterdam on September 5, and the Dutch department of science and technology has signed a Memorandum of Understanding with the Beijing city government. “The fact that Beijing won the 2022 Winter Olympic Games gives it the incentive and we are the first answer,” Roosegaarde said. Companies are trying to cash in on the Chinese public’s growing demand for clean air as thick choking smog blocks out the sun and wreaks a heavy toll on public health. A recent study said poor air quality could be responsible for up to two million premature deaths a year in China, while the documentary Under The Dome examined the impacts of air pollution in Chinese cities and its causes, garnering hundreds of millions of clicks. Sales of air filters have soared amid public health fears and a diverse market of anti-pollution products, ranges from simple face masks and smog-sponging household plants to highly-elaborate filtration technologies or even completely pollution-proof offices and homes. In 2013, consumers on China’s biggest online e-commerce site, Taobao, spent 870 million yuan (US$140 million) on anti-smog goods such as face masks and air purifiers, and the figure is likely to have risen last year as consumers became increasingly aware of the harm caused by bad air. Multinational engineering company Arup recently teamed up with Hong Kong property developer Sino Green to provide filtered air zones to cocoon people from heavily-polluted air, akin to the way a bus-stop protects commuters from wind and rain. Many small-scale innovations aimed at solving the pollution problem can, at first glance, appear as gimmick-driven attempts to cash in on China’s environmental crisis. Or such technologies can look hopelessly inadequate given the scale of the problem. China’s leaders face a huge task in reversing pollution after half a century of heavily-industrialised economic development has spoiled air, water and soil in many parts of the country. The project is even more idiosyncratic than its first appears. 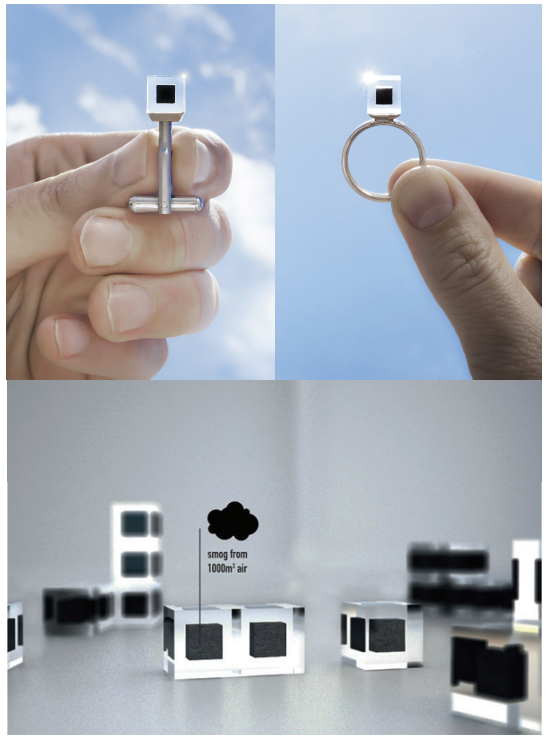 The harvested smog will be compressed into cubes that will be used to make quirky jewellery. Roosegaarde hopes the cubes of black smog will become popular engagement rings – a distinctive token of love and at the same time a signal to take action on improving the environment. Architects have a major responsibility to deploy their passion and expertise to create low carbon cities, Roosegaarde says. “Architecture used to make wild statements about the future of the city. Now architects seem completely disconnected from how cities are created,” he says. Roosegaarde’s previous projects have also aimed to change the way people interact with the environment: smart highways that glow in the dark, harvest energy and adapt to differing traffic situations; and a sustainable nightclub floor that generates energy when people dance.